A Harvard-led team is the first to demonstrate the ability to use low-power light to trigger stem cells inside the body to regenerate tissue, an advance they reported in Science Translational Medicine. The research, led by Wyss Institute Core Faculty member David Mooney, Ph.D., lays the foundation for a host of clinical applications in restorative dentistry and regenerative medicine more broadly, such as wound healing, bone regeneration, and more. The team used a low-power laser to trigger human dental stem cells to form dentin, the hard tissue that is similar to bone and makes up the bulk of teeth. What’s more, they outlined the precise molecular mechanism involved, and demonstrated its prowess using multiple laboratory and animal models. A number of biologically active molecules, such as regulatory proteins called growth factors, can trigger stem cells to differentiate into different cell types. Current regeneration efforts require scientists to isolate stem cells from the body, manipulate them in a laboratory, and return them to the body—efforts that face a host of regulatory and technical hurdles to their clinical translation. But Mooney’s approach is different and, he hopes, easier to get into the hands of practicing clinicians. The team first turned to lead author and dentist Praveen Arany, D.D.S., Ph.D., who is now an Assistant Clinical Investigator at the National Institutes of Health (NIH). At the time of the research, he was a Harvard graduate student and then postdoctoral fellow affiliated with SEAS and the Wyss Institute. Arany took rodents to the laboratory version of a dentist’s office to drill holes in their molars, treat the tooth pulp that contains adult dental stem cells with low-dose laser treatments, applied temporary caps, and kept the animals comfortable and healthy. 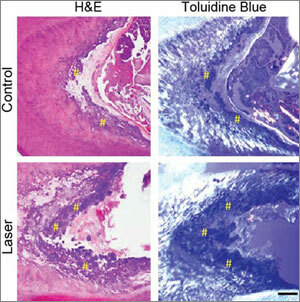 After about 12 weeks, high-resolution x-ray imaging and microscopy confirmed that the laser treatments triggered the enhanced dentin formation. “It was definitely my first time doing rodent dentistry,” said Arany, who faced several technical challenges in performing oral surgery on such a small scale. The dentin was strikingly similar in composition to normal dentin, but did have slightly different morphological organization. Moreover, the typical reparative dentin bridge seen in human teeth was not as readily apparent in the minute rodent teeth, owing to the technical challenges with the procedure. “This is one of those rare cases where it would be easier to do this work on a human,” Mooney said. Next the team performed a series of culture-based experiments to unveil the precise molecular mechanism responsible for the regenerative effects of the laser treatment. It turns out that a ubiquitous regulatory cell protein called transforming growth factor beta-1 (TGF-1) played a pivotal role in triggering the dental stem cells to grow into dentin. TGF-1 exists in latent form until activated by any number of molecules. Here is the chemical domino effect the team confirmed: In a dose-dependent manner, the laser first induced reactive oxygen species (ROS), which are chemically active molecules containing oxygen that play an important role in cellular function. The ROS activated the latent TGF-_1complex which, in turn, differentiated the stem cells into dentin. Nailing down the mechanism was key because it places on firm scientific footing the decades-old pile of anecdotes about low-level light therapy (LLLT), also known as Photobiomodulation (PBM). Since the dawn of medical laser use in the late 1960s, doctors have been accumulating anecdotal evidence that low-level light therapy can stimulate all kind of biological processes including rejuvenating skin and stimulating hair growth, among others. But interestingly enough, the same laser can also be used to ablate skin and remove hair_depending on the way the clinician uses the laser. The clinical effects of low-power lasers have been subtle and largely inconsistent. The new work marks the first time that scientists have gotten to the nub of how low-level laser treatments work on a molecular level, and lays the foundation for controlled treatment protocols. Next Arany aims to take this work to human clinical trials. He is currently working with his colleagues at the National Institute of Dental and Craniofacial Research (NIDCR), which is one of the National Institutes of Health (NIH), to outline the requisite safety and efficacy parameters. “We are also excited about expanding these observations to other regenerative applications with other types of stem cells,” he said. 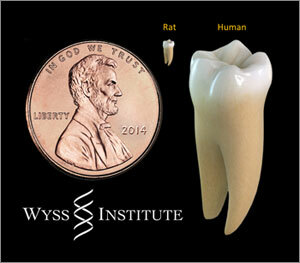 This work was a collaboration between the Wyss Institute, Harvard SEAS, Harvard School of Dental Medicine, Leder Human Biology and Translational Medicine, National Institute of Dental and Craniofacial Research (NIDCR) and NIH, Wellman Center for Photomedicine at Massachusetts General Hospital, Harvard Medical School’s Department of Dermatology, Harvard-MIT Division of Health Science and Technology, Boston Children’s Hospital, and New York University School of Medicine. It was funded by the Wyss Institute, Harvard Presidential Scholarship, Harvard Catalyst, Harvard Clinical and Translational Science Center, NIDCR and NIH. The Wyss Institute for Biologically Inspired Engineering at Harvard University (http://wyss.harvard.edu) uses Nature’s design principles to develop bioinspired materials and devices that will transform medicine and create a more sustainable world. Working as an alliance among all of Harvard’s Schools, and in partnership with Beth Israel Deaconess Medical Center, Brigham and Women’s Hospital, Boston Children’s Hospital, Dana Farber Cancer Institute, Massachusetts General Hospital, the University of Massachusetts Medical School, Spaulding Rehabilitation Hospital, Boston University, Tufts University, and Charité – Universitätsmedizin Berlin, the Institute crosses disciplinary and institutional barriers to engage in high-risk research that leads to transformative technological breakthroughs. By emulating Nature’s principles for self-organizing and self-regulating, Wyss researchers are developing innovative new engineering solutions for healthcare, energy, architecture, robotics, and manufacturing. These technologies are translated into commercial products and therapies through collaborations with clinical investigators, corporate alliances, and new start-ups. The National Institute of Dental and Craniofacial Research (NIDCR), part of the federal National Institutes of Health, is the Nation’s leading funder of research on oral, dental, and craniofacial health. The Harvard School of Dental Medicine (hsdm.harvard.edu) educates clinicians, educators, researchers, and leaders in the profession; boasts a core strength in bone biology research; and offers students public health opportunities in local communities and across the globe. The predoctoral student experience includes small class sizes, a required research component, and education together with medical students at Harvard Medical School. Postdoctoral students in the dental specialties also draw upon the educational richness of local hospitals and research institutes. Faculty and student practitioners at the Harvard Dental Center, the School’s patient care facility, welcome more than 25,000 patients for over 57,000 dental visits every year.